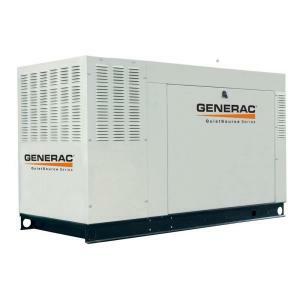 Click the button below to add the Generac 45,000-Watt Liquid Cooled Standby Generator (Steel, Natural Gas, CARB) to your wish list. The experts in home standby generators present the Generac Guardian Series 45kW standby generator. Driven by the reliable, increased horsepower of a Generac 2.4L automotive-style, liquid-cooled engine, the 45kW Guardian Series can provide automatic whole-house protection for larger homes, or essential circuit protection for small and medium businesses such as pharmacies, restaurants and municipal buildings. Choose from a variety of transfer switches to meet any need, including the Nexus Smart Switch. Engineered with Generac’s Digital Load Management (DLM) technology as standard equipment, the Nexus Smart Switch allows for more coverage with a smaller generator through smart load management. The Guardian Series is America’s #1 selling family of home standby generators. They run on your existing natural gas or LP fuel supply, and kick in automatically within 10 seconds of determining utility power failure. UL/CUL Listed. This item cannot be returned.